Excerpts from a panel discussion “The Future of Life Sciences Start-ups — the Intersection of Academia and Industry” hosted by Purdue University at NCBS, Bangalore. 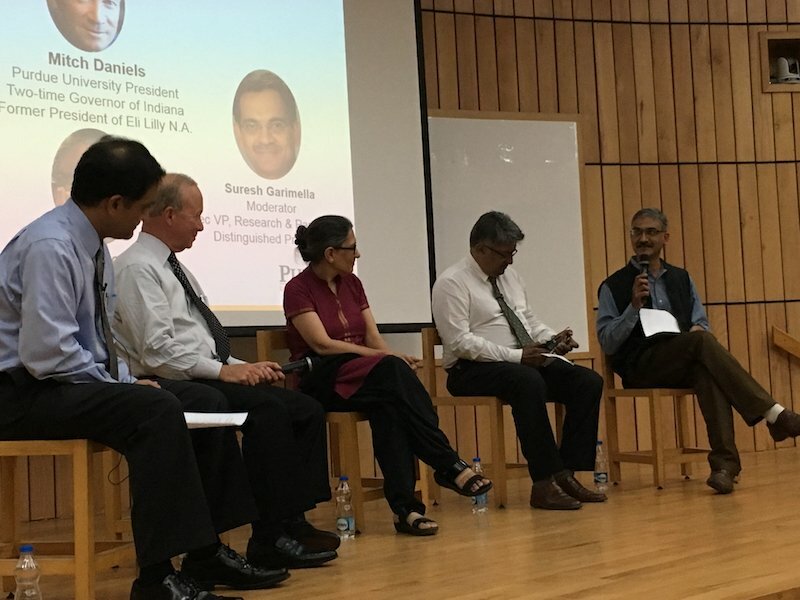 Leaders from academia and industry in Bangalore shared the stage with visitors from Purdue University to discuss and address questions about the future of life startups at a panel discussion hosted by the National Centre for Biological Science (NCBS), Bangalore on 25 October 2016. Much of the discussion centred around how academia and industry could support and nurture an entrepreneurial ecosystem for young students and researchers. Some concerns and challenges in the current Indian scenario were touched upon and the experts from Purdue shared their experiences in managing similar issues. “Purdue is a State University that is involved in a lot of translational activities. The ecosystem they have developed to encourage incubators and entrepreneurial activities is impressive,” said Satyajit Mayor, Director, NCBS, appreciating their efforts to reach out and share some of their learning about how a [publicly-funded] academic campus can promote innovation. The panelists at the discussion included Mayor, Vijay Chandru, Founder and Chairman, Strand Life Sciences and Gayatri Saberwal, Institute of Bioinformatics and Applied Biotechnology (IBAB) from Bangalore, and Mitch Daniels, President, Purdue University. The panel discussion was moderated by Suresh Garimella, Executive Vice President, Research and Partnerships at Purdue University. Garimella initiated the conversation by giving the audience a flavour of the flourishing entrepreneurial activity at Purdue University. The University has embraced innovation and has several centres and programs that stimulate and foster entrepreneurship among faculty and students. Purdue provides startup coaching, funding, mentorship and space for budding entrepreneurs. He ended by inviting comments from the panel about the state of life science startups in India and the challenges they face in finding collaborators. Mayor and Chandru both agreed that there has been a cautious but apparent shift within the life science community to thinking about translation. Funding remains an issue, acknowledged Saberwal. “[Academic] research is largely supported by public funds and there are strictures that come with the territory. More private funding would be hugely useful,” said Mayor. Chandru observed that there is now a good structure in place for seed funding, but many companies get stunted because of lack of funds at the next level of growth. Once the floor was opened for questions, a lively discussion ensued on efforts by scientists to draw in industry, the challenges for different types of IP startups, the lack of clarity in regulations and licenses and how (and whether) private funding would shape research. The importance of establishing an engine that supports discovery and the role of experienced mentors in guiding first-time entrepreneurs was revisited in several contexts. “We are always shopping for ideas to make our ecosystem faculty-friendly, investor-friendly and student-friendly,” said Mitch Daniels, President, Purdue University. Daniels’ deep understanding of how education, knowledge and research are connected and need to be strongly developed in order to achieve real translation was apparent to the audience. “Getting a good understanding of what they do by interacting with the President and Suresh was interesting and informative for all of us,” said Mayor.